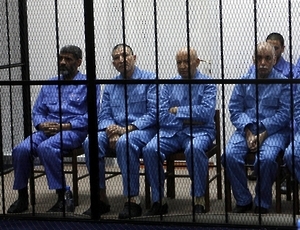 The trial of over 30 former government officials, including ICC suspects Saif Gaddafi and Abdullah Al-Senussi, began this week amid security concerns in Tripoli, but was quickly adjourned after key defendants, including Gaddafi, failed to appear. Gaddafi, who is in the custody of a Zintan militia, was supposed to participate via video link along with several others. The trial is set to resume on 27 April. Amnesty International questioned Libya’s decision to try defendants via video link, saying that it infringes on their rights to a fair trial. Human Rights Watch also urged the Libyan government to ensure fair trials for the former officials, and called for Gaddafi’s transfer to the ICC. In an op-ed, Human Rights Watch’s Hanan Salah detailed the disarray plaguing Libya’s justice system. 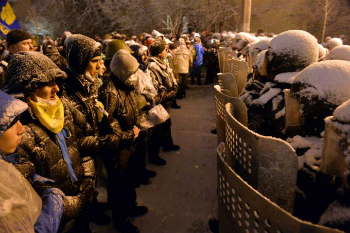 Yesterday, Ukraine accepted ICC jurisdiction over alleged crimes committed during the “Maidan” protests. In a letter to the Court, the government of Ukraine formally requested the ICC to exercise jurisdiction over events in Ukraine from 21 November 2013 to 22 February 2014. The Coalition welcomed the move, calling it a positive indication of the Ukrainian government’s commitment to ending impunity. The International Federation for Human Rights also welcomed Ukraine’s decision, but called for the government to widen the scope of its declaration ensure that the Court has jurisdiction over events in Crimea. Tiina Intelmann, president of the ICC Assembly of States Parties, urged Ukraine to fully ratify the Rome Statute. Earlier in the week, the Ukrainian cabinet requested that the constitutional court determine the constitutionality of Ukraine possibly ratifying the Rome Statute. The presentation of evidence in the ICC trial of former DRC vice president Jean-Pierre Bemba ended after almost three and a half years. Bemba’s lawyer accused the Netherlands of violating the immunity of the ICC by recording Bemba’s telephone conversations. Meanwhile, Chad completed its withdrawal of forces from the CAR, and the UN is seeking $274 million to address the country’s humanitarian crisis. ICC judges summoned eight witnesses to appear in the Ruto/Sang trial and requested the Kenyan government’s cooperation with the summonses. A prosecution expert witness tracked the movements of Kenyan Deputy President William Ruto and broadcaster Joshua Sang in order to prove they could have traveled to meetings where the post-election violence was allegedly planned. Proceedings in the Ruto/Sang case adjourned for three weeks for Easter. Ruto said that the ICC process has been a “waste of time,” while his lead defense counsel answered a series of questions from the public and described his case as ‘nonsense’. A Daily Nation columnist challenged a Kenyan legislator’s claim that the country is committed to international treaties, specifically questioning Kenya’s record cooperation with the ICC. The ICC vacated the 5 May start date of the Abdallah Banda trial due to logistical difficulties. Sudan’s defense minister, Abdel-Rahim Hussein, said that the rebellion in Darfur has receded. The head of UNAMID indicated that the peacekeeping mission will likely have to make do with less resources in the future. RENADHOC condemned the DRC government for selectively apply its amnesty law. Thomas Lubanga appealed the postponement of his appeals hearing. A UN report showed limited progress in fighting sexual violence in the DRC. In a podcast, the International Center for Transitional Justice analyzed the Ivorian government’s efforts to secure accountability and reconciliation after the country’s post-election violence. Prime Minister Daniel Kablan Duncan dismissed allegations that his government is prosecuting only its rivals for post-election violence crimes, saying that the country’s judicial system is limited but justice will be done. The head of an Ivorian victims’ group said that the ICC has an “obligation” to confirm the charges against Laurent Gbagbo (in French). The UN welcomed Côte d’Ivoire’s decision to reconstitute its Independent Election Commission. A Ugandan politician accused Ugandan President Yoweri Museveni of prolonging the LRA conflict by delaying peace talks. The African Union expressed concern at human rights violations in Mali. Human Rights Watch condemned Nigeria for failing to investigate escalating communal violence. A bombing at a bus station outside the capital Abuja killed 71, and as over 100 Nigerian schoolgirls were abducted by the Boko Haram rebel group. Ban Ki-moon condemned the abduction, noting that it is a violation of international humanitarian law. Georgia stated its concern over a violation of Georgian airspace near Abkhazia by a Russian aircraft, and Russian and Georgian diplomats met in Prague. Al-Haq welcomed Palestine’s accession to a number of human rights treaties and urged it to join the ICC as well. The Palestinian Centre for Human Rights also called on Palestine to join the Court, while Human Rights Watch criticized the US for opposing any Palestinian moves to accede to the Rome Statute. The Coalition joined Parliamentarians for Global Action and the Trust Fund For Victims in mourning the passing of A.N.R. Robinson, who played a crucial role in the establishment of the ICC. The International Bar Association welcomed the agreement between the ICC and Belgium on the interim release of Court detainees. No Peace Without Justice welcomed the French initiative to have the UN Security Council refer the Syrian conflict to the ICC, while Human Rights Watch called on Council members to support the initiative. The International Federation for Human Rightswelcomed the opening of an investigation into a French company’s alleged complicity in acts of torture in Syria. A member of the Syrian opposition said that he expects Bashar Assad will wind up before the ICC, and several chemical gas attacks were reported in Syria. The Washington Post editorial board argued that the UN Security Council should consider referring North Korean crimes against humanity to the ICC. A Russian MP asked investigators to prepare a letter to the ICC asking the Court to look into alleged Ukrainian nationalist group behavior. The Trust Fund for Victims Board of Directors approved its draft strategic plan and raised the reparations reserve with €1 million. Finally, Tiempo Global interviewed the Coalition’s Michelle Reyes Milk on the 20th anniversary of the Rwandan genocide (link in Spanish).